Details relating to the Austrian Commemorative of 2005. With this coin Austria marks the 50th anniversary of the signing of the Austrian State Treaty. The treaty was signed on 15th May 1955 and came into effect 27th July of the same year. It was signed by the four Allied occupying forces – France, Russia, The United Kingdom and The United States. The treaty in effect re-established Austria as a sovereign state. In the inner circle is a representation of the signatures and seals. At the bottom – seven o’clock is the year of issue 2005. 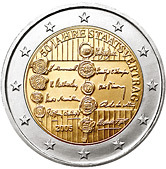 50 JAHRE STAATSVERTRAG (50 Years State Treaty). All in all, a very interesting Commemorative Coin. Return from Austrian Commemorative 2005 to euro coin collector.